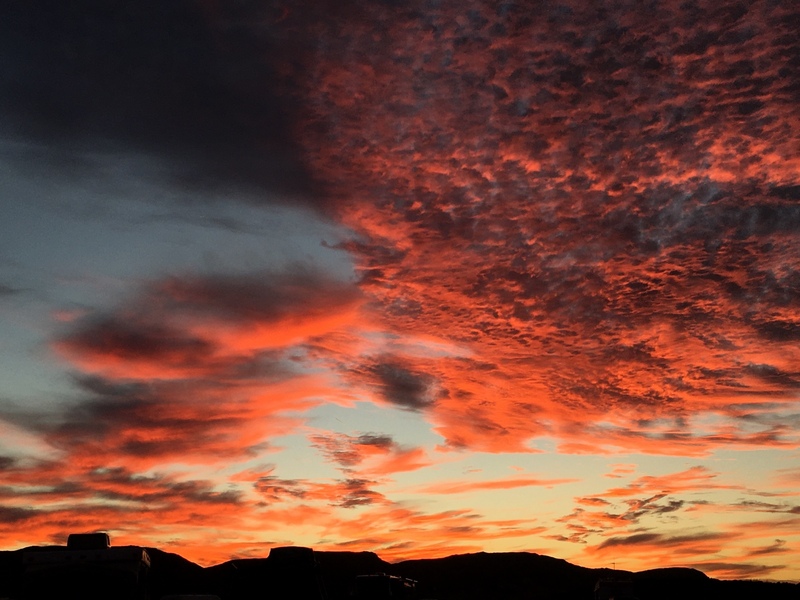 Another gorgeous sunset at the BLM’s Imperial Dam Long Term Visitor Area. I grabbed this shot with my iPhone. 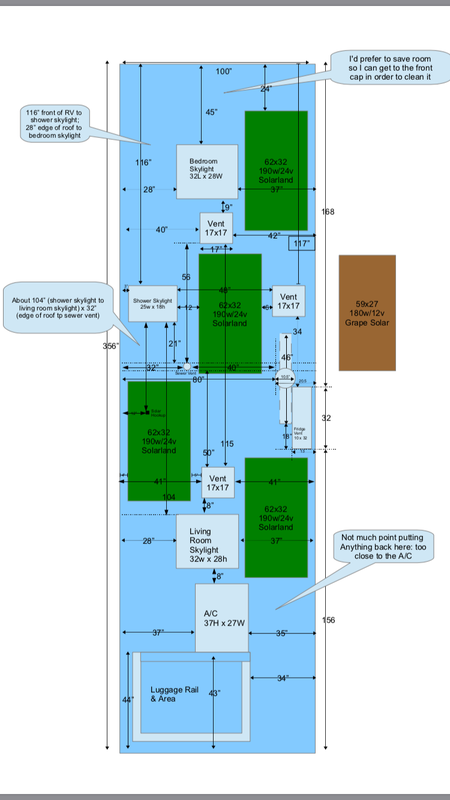 In my most recent post I promised an upcoming article about a DIY inverter installation. I haven’t gotten around to that yet and I apologize to everyone who has been breathlessly waiting for it… both of you! 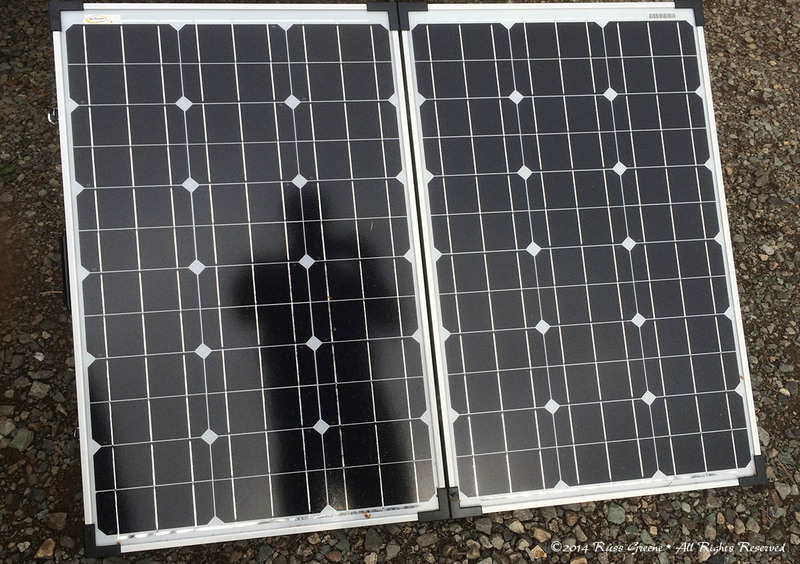 As for an explanation as to why that post has been delayed, well, I have been working on something of a larger project that has demanded my attention and kept me away from my writing desk: a DIY solar install on the RV. That job, now largely complete, shall be the subject of this post, or series of posts. 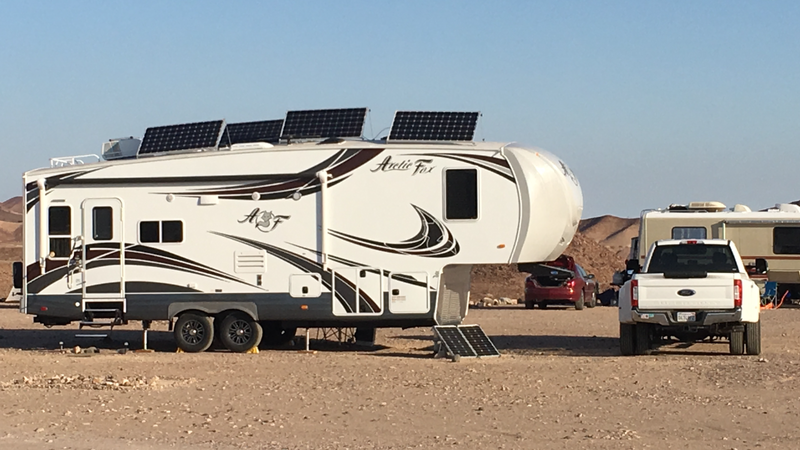 Over the past weeks and months I have been working on designing and installing a more complete and robust solar installation on my current RV. This system, now fully operational, includes four, rooftop mounted and tilt-able 190 watt solar panels, a 60 amp TriStar MPPT solar charge controller, 4 LifeLine 6 volt AGM batteries (wired in series/parallel to make 12 volts), and a Bogart Engineering TM-2030 battery monitor along with a remote control for the TriStar controller. Of course, there are a number of minor components such as circuit breakers, busbars, terminal blocks, etc., but the components I listed above are the major players of the system. As a first step in planning an RV solar installation many people write about figuring out what your electrical demands will be and then planning the system size and components accordingly. Personally, I think, that while this may sometimes be valuable it isn’t always practicable. It involves cataloging all the devices and appliances you will be using, how much current they draw and how long you will use these devices every day. In other words, this means figuring out how much electricity you will need. It seemed to me that, for me, calculating this might be something marginally more possible than guessing the next winning lottery numbers. If you have an established RVing routine and the ability to measure all these things then this sort of assessment may be more useful, but even then electrical demands and the ability to generate power will change from season to season with the varying number of daylight hours as well as one’s current latitude to say nothing of the weather. In my case I didn’t see how I could undertake a truly valuable assessment. I had no history in this RV. I should say “we” instead of “I” because I now have Diane as my partner in crime. Nor do we have too much of an idea of what our camping style will be. So, I took another tack which was to put as much solar on the roof of my RV as I could because, as they say, you can never have too much. However, I’m not so sure about that either. I used the Draw modue of Open Office to construct this diagram of the rooftop of my RV. Then I tried placing different solar panels I drew to scale in various places. This is the final layout I made. Once I figured out which panels I thought would work best—part of this was the operating voltage which I will discuss below—I made a cardboard cutout the size of one of them, took it up to the roof to check the fit in the planned mounting positions. It would have been better to make four cutouts, but who has that much cardboard? I used some painter’s tape to mark the corners of the planned panel mounting positions. Then I walked from the back of the RV to the front, to see if I would be able to comfortably and safely step over and around everything as well as being able to access the corners of each panel in order to tilt them. It was a rehearsal, a pantomime. In picking out which panels to get one consideration of course was their physical size. 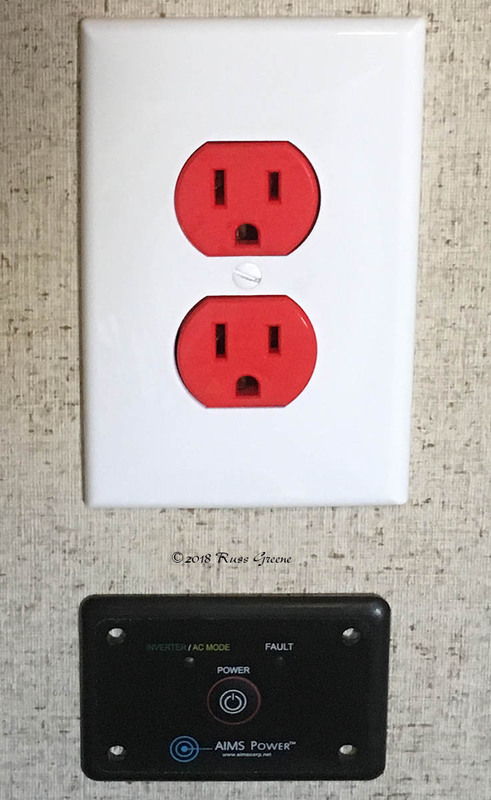 Another was their voltage. My lay understanding is that RVs have 12 volt systems and solar panels that can operate with RV systems can be 12 volt panels, 24 volt panels, 36 volts or perhaps even 48 volt panels but that 24 volt panels and above must be used with a solar controller that can reduce the voltage to the 12 volts used by RV systems. The advantages of using solar panels that produce higher voltages include they are both more efficient and that smaller wires (less expensive and easier to work with) can be used to carry the electricity from the rooftop to the solar controller wherever it is located (usually somewhere inside the RV). My choice of the Solarland 190 watt, 24 volt panels was made because they offered the advantages of a higher voltage (above 12) while fitting the spaces I had on the RV roof. BigAss & Blossom: our truck and RV respectivley, with Blossom sporting her new do of four rooftop solar panels. Sunny, our little 120 watt portable on the ground is facing east and the first to ctch the morning rays. I chose a Tristar 60 amp MPPT solar controller from Morningstar. They have an excellent reputation and the MPPT style controller can transform excess voltage into usable amperage. This is where toast comes in… Our panels are rated at about 41 amps combined output for the four of them. When using our toaster the other day which puts a high demand on the system the TriStar remote panel we installed indicated 54 amps being sent to the batteries, 13 amps more than our panels can produce—it converted excess voltage to amperage thereby sending to the batteries more amps than the panels actually produce. Again, that’s my lay understanding of things, anyway. With all the wattage we have on the roof and the storage capacity of our battery bank we can make toast on a cloudy day. That may not seem like much when you live in a stIcks and bricks home, are plugged into shore power at a campground or running a generator, but when you are living off-the-grid on solar power alone it’s a pretty big deal. This blog takes an enormous amount of time and energy to build and maintain . If you have found something useful or entertaining please use this Amazon.com link when you shop at Amazon. Doing so will cost you no more and in some cases I may receive a small commission. Your support in the form of using my Amazon.com link or making a PayPal Donation will be greatly appreciated. Thank you. 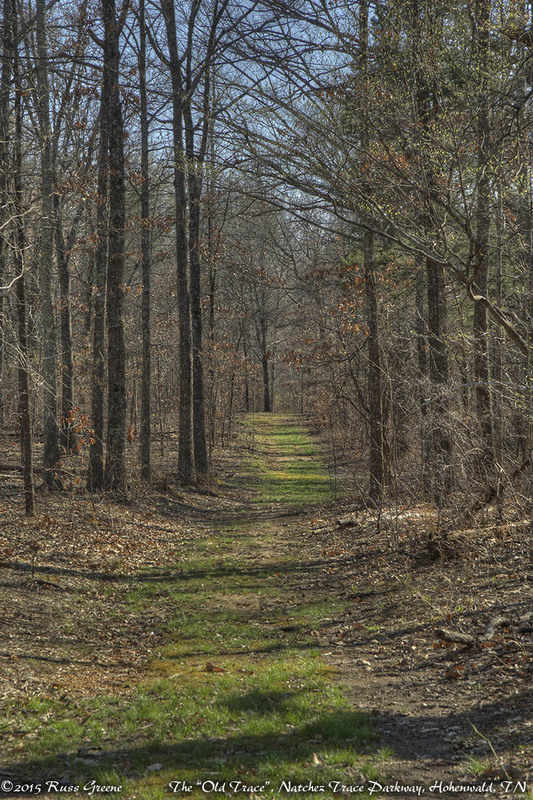 This shot represents an idyllic section of the original Natchez Trace, the Old Trace as it is sometimes called. In reality, some sections of the Trace at times were miserable with water and mud, heat, humidity, insects and highwaymen (robbers). Travel was sometimes extremely difficult, even impossible. The campground sits on a hilltop and as I wrote this in early April many if not most sites have views through the trees in one or more directions. Once the trees fill out with the new leaves leaves of spring (they were still bare when I was there) those views will likely disappear–the campground is in a forest of deciduous trees. 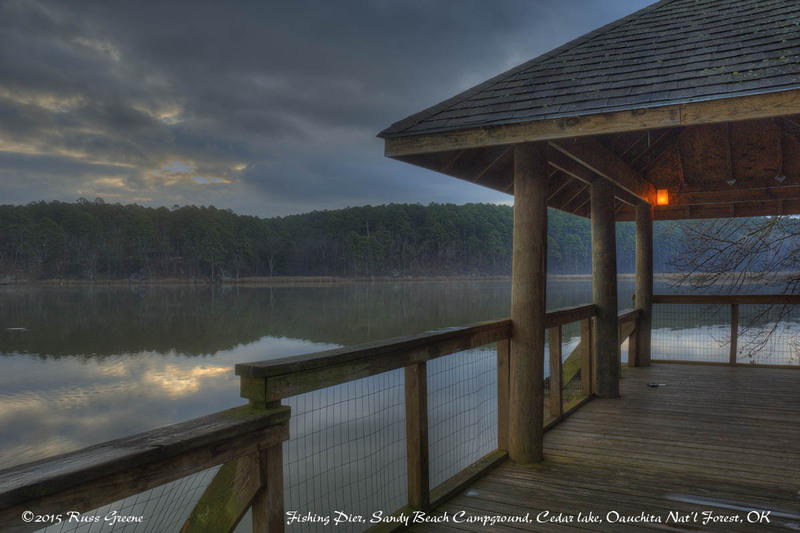 Fishing pier, Cedar Lake, Sandy Beach Campground, Ouachita National Forest, OK. This vicious beast, in reality, is really cute little dog that suffers from an overbite. 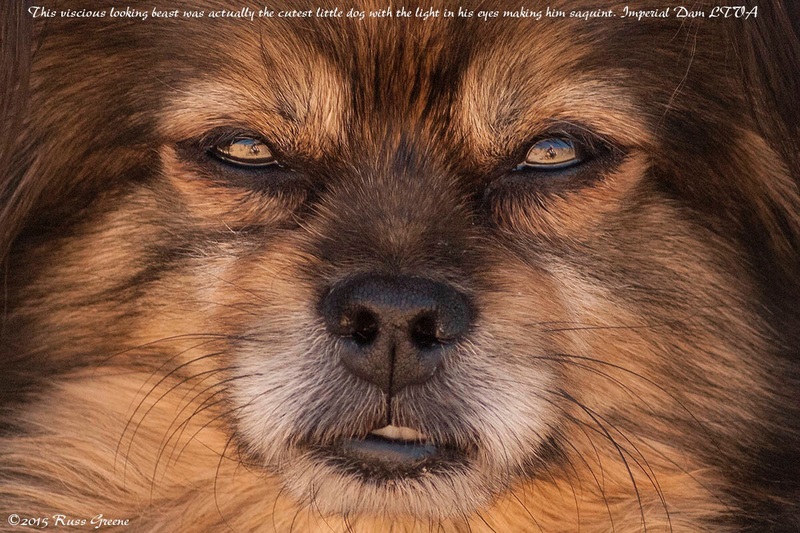 The the light in his eyes is making him squint as they reflect the color of the sandy hillside behind me giving him, along with the overbite, a rather menacing appearance. Other than belonging to someone here at Imperial Dam LTVA this pooch has nothing to do with this story but made for a good lead in, I thought. From South Mesa at Imperial Dam LTVA it’s about 8 or so miles up a dirt road Ferguson Lake. 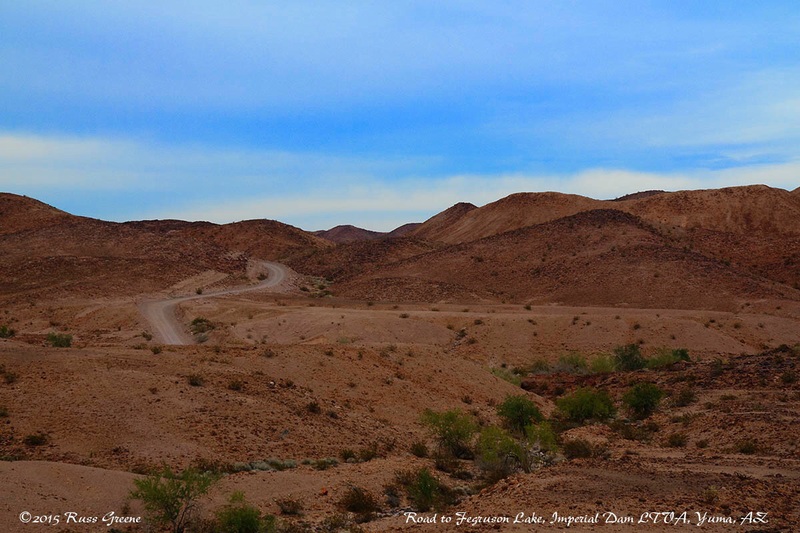 The road had just been graded when I was there so passage was easy. The countryside is desolate but beautiful. I saw two other vehicles on that drive.